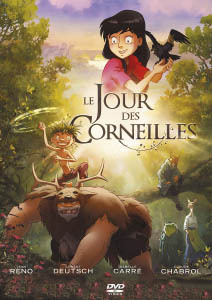 Le jour des corneilles (The Day of the Crows) is a 2012 French-language animated film for kids. While I was initially intrigued by the anthros at the end of its trailer, it turns out the furry content is marginal at best. Still a good film though! The running time is about 94 minutes. 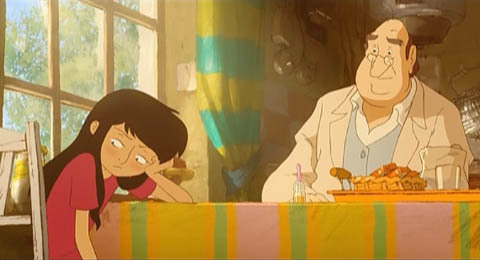 It was co-produced in France, Belgium, Luxembourg and Canada, directed by Jean-Christophe Dessaint, written by Amandine Taffin, and was loosely inspired by a book written in 2004 by Jean-François Beauchemin. A recent trend in movies like Hotel Transylvania and The Croods has been fathers trying to guard their children from outside influences. This is also the premise of The Day of the Crows, in which Courge and his son live like wild men in the forest. "Courge" means "gourd" or "squash", and also implies "idiot"; and his son doesn't have a name, so I'll refer to him as the kid (with apologies to Bastion). Courge hates and is paranoid of human civilization, to the point of raising his son to think that there aren't any other people in the world. The kid believes that if he steps outside the forest, he'll disappear forever - until one day he sees two figures walking far in the distance, and begins to wonder. Soon afterwards, there's a terrible storm in which Courge breaks his leg and falls unconscious. 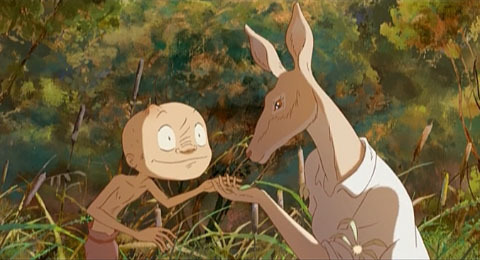 The kid seeks help from the spirits that live in the forest (he can see them, while his father can't), and they encourage him to go into the outer world, where he finds a village and a doctor. Unable to care for Courge while the semi-feral kid constantly keeps guard, the doctor calls on his daughter Manon to help, and after a rough start, she and the kid become good friends. While they're in town, they're set upon by Mrs. Ronce (which means "bramble"), a mean old lady who knows something of Courge's past and is dead-set on getting everyone to hate him, to the point that even Manon and the kid begin to have doubts. The kid's feelings aren't improved by the fact that his dad is like an ogre out of a fairy tale. And in the span of a few days, the kid is shown more kindness than he probably receives from Courge in an entire year. When Courge recovers and they return to the forest, Courge wants to continue living as before; and his son tries to work around his father's gruff exterior and find paternal love. The ending is bittersweet - more sweet than bitter - all I'll say is that I think things will work out for the kid in the long run. The characterization in this film is great, you really feel for everyone. The kid is scrawny, agile, honest and curious, and is doing his best under difficult circumstances. His father is a monstrous, tragic figure, partially insane and rather frightening, and even though he can be a real jerk towards his son, deep down you know he cares, even if his methods are misguided. Mrs. Ronce is delightfully awful, there wasn't a single scene where I didn't hate her almost immediately, and she doesn't waste any time persuing her goal. The doctor is warm and caring, as well as stern and practical when he needs to be. 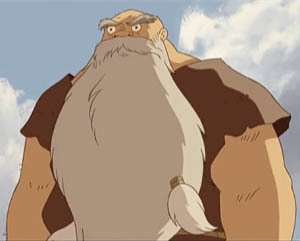 An ideal father for Manon, who's simply a kind soul and a good friend. My only complaints about this film are really minor. When Courge's backstory is finally revealed, it's given only minimal details. I really wanted to know more about what had happened in the past, what kind of person he used to be, and how Mrs. Ronce's hatred developed (aside from the main reason shown). Then there are two parts of the film where I had difficulty suspending my disbelief. One involves animal intelligence, and the other involves a rather abrupt change that one of the characters undergoes - a real "WTF?!" moment. But this is all blown away by really good animation, great character designs, beautiful backgrounds, good voice acting (in French, anyway), some really moving moments, the music, and no one breaks into song! And hey, what about the furry content? Those are the forest spirits. Ghosts, actually - one of them is the spirit of the kid's mother. The kid can talk to them, but they can't talk back, except by using body language. They can also manipulate objects. All have animal heads stuck on top of human bodies, with human hands and no tails. They wear winter coats and jackets, dotted with leaves here and there. Overall, they're minor characters. Still cool to see, great mannerisms. Despite the minimal anthropomorphism, I definitely recommend this film! But if all you want are the clips with the forest spirits, I've made a 15-minute supercut on YouTube, which contains major spoilers, including scenes from the ending. (I'd suggest stopping before the 10-minute mark.) I also threw in an extra bit with a crow. The crows in the film's title refer to two things; an incident in Courge's past, and an injured crow that the kid befriends later on. I'm not sure if an English copy of this film is available yet. There's definitely a DVD in Canada (Remstar/Entertainment One), but it's only in French, despite what Web pages say. Luckily there's an English subtitle file floating around on the Internet. The grammar and choice of wording is occasionally a bit odd, but not to the point of being distracting; it's a decent enough job, wherever it came from. 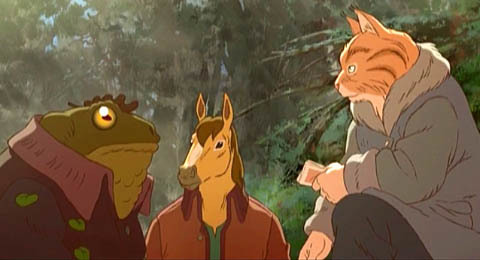 The only remaining (recent) French animated film with animals that I haven't reviewed yet is Zarafa, but it's not anthropomorphic. (OK, I also didn't review A Cat in Paris, but that's because the cat's role is small and it's not even close to being furry.) Anyway, I feel like I need a momentary break from kids' movies. What do you folks think? Should I review Zarafa? Anyone else want to take a stab at it? I don't care much about Zarafa the movie - I did meet up with Zarafa the fursuiter recently at Califur, who had a nice suit!